PP 005: Bunnygrunt - Lady, You Just Got Von Damaged! UPDATE (05/16/2011): The official wide release of this record has now OCCURRED! The special limited editions are still available for the time being, but if you want the regular ol' version, we've got 'em! 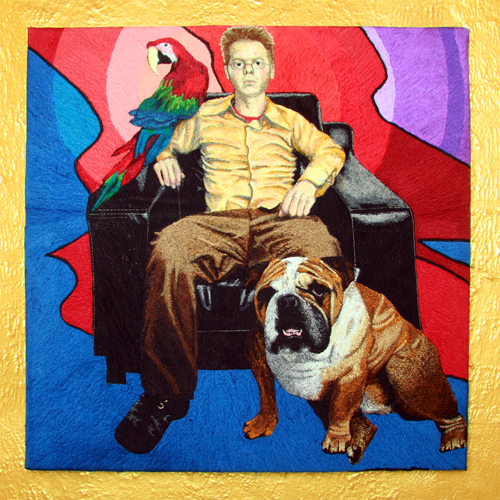 The artwork looks like what you see above--it's an embroidery-painting by Amy Froggpockets featuring Bunnygrunt drummer Eric Von Damage hanging out with some of his friends (Gabel the macaw and Logan the bulldog). Click the same link below from before to order yer own copy NOW ($6.75 postage paid)! PLEASE SPECIFY which version you want; if you don't, I'll send you the wide-release regular-edition version as a default. All versions of the record come accompanied by complimentary digital download. The official wide release of this 45RPM seven-inch is still forthcoming, but for those that're interested, there is a 39-copy limited edition run known as the "39 Forever Edition." It was released for Matt's birthday on 09 October MMX. 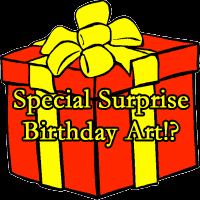 This limited edition is hand-numbered and hand-giftwrapped, and contains party favors and special artwork within. It costs $6.75 postage paid, click the icon below to order (while supplies last)! Bunnygrunt also has the fifth track on PP 000 (Pancake Productions Summer Sampler MMX) and the fifth-to-last track on PP 007 (Pancake Productions Wintry Sampler MMXI). The former is an unreleased track ("Outer Spaceways Incorporated"), the latter is "Young Abe Lincoln" from PP 005. The RFT names it one of the best 40 releases from Saint Louis in 2012. There's no reason to click that link, though, because neither did they review it, nor does the link they linked-to as their ostensible review of it actually mention the record even once. But still, IT IS AN HONOR!